Norman (in red) and Sylvia (seated) posing for pictures after running the dogs. Monday, November 17, 1980— I ran Fear, the lead dog, Oscar, Mack and Chrissy twice today—three miles each time. They are doing pretty well. Weather is nice, a low of zero degrees to a high of 10 above. Called Nadia, Ernie H. and Jim R.
Thursday, November 27, 1980—Charlie helped me run the dogs again today. Things didn’t go well. This is discouraging. Fear, the lead dog just isn’t strong headed enough to lead the dogs. Friday, November 28, 1980—cut up firewood for the lodge garage, their saw is broke down so we used my saw. Did chores and took care of the dogs and ran Sylvia to Gunsight to help Nancy at the lodge. Mike was here and visited for a while. Monday, December 1, 1980—up early, took Sylvia to Gunsight, helped Ray a little then came back and hitched the dogs to the sled and took them to Libby Riddles place (three miles). She put a dog called Phantom in my team. Had a good run, lots of excitement. Broke my brake on the grade off of Snowshoe Lake so I turned back for home to make repairs. Tuesday, December 9, 1980—it’s -37° this morning. I glued the heels of my Sorel boots where they were weakening. Took my dogs on a training run in the afternoon at -40°. At supper time, Mike P. called. Wednesday, December 10, 1980—put the snow hook holder that I made out of leather onto the dog sled, allowing me to more safely carry the snow hook when I’m driving the dogs and the sled. I put some oil in the front differential of the pickup and cut up some logs for Henry. It was -35° all day and dropped to -40° this evening. Thursday, December 11, 1980—I read late last night and slept late this morning. Henry’s water system froze up and I helped get it thawed and back in service. Took dog collars and a chain and a snow hook back that I had borrowed from Libby Riddles. Now I have my own equipment. It’s -45° today. Friday, December 12, 1980—hitched up the dogs this morning at -48° and took pictures in front of the cache here at the lodge of the dogs and sled. I tried to run them, but Fear, the lead dog that I got from Libby just wouldn’t lead. The pups sure wanted to go. It’s discouraging—maybe she thought it was too cold. Dan’s wife Patti had asked him to bring his van down for me to take into Anchorage. He did it, but didn’t understand why Patti wanted me to drive it into Anchorage. Unbeknownst to him, Patti had made arrangements in Anchorage for his van to have a new paint job. She wanted to surprise him for Christmas. 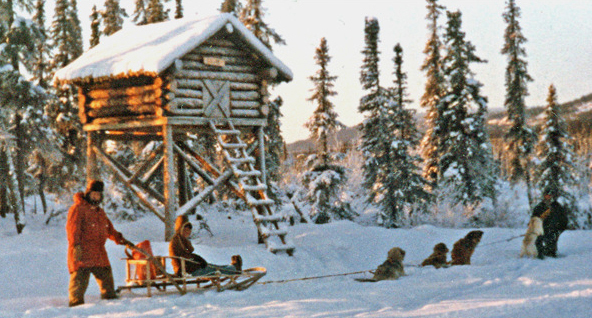 This entry was posted in Journal Entry and tagged Alaska, cache, dogsled, Nelchina. Bookmark the permalink.